As part of a new project at the nature center where I work we've set up a new feeder cam to capture birds coming to our bird feeders. I'll make the link public once it goes live. With all of our feeders we tend to go though a lot of bird seed. Just a few days ago my co-worker Kelly went and picked up 200 pounds of black oil sunflower seeds and another 20 pounds of nyger. That should hold us for a while! The camera we have on our feeder sends an image down to the Science Museum of Minnesota once every minute. This image will then be displayed on the ScienceBuzz kiosk in the Mississippi River Gallery. The images will also be available online. 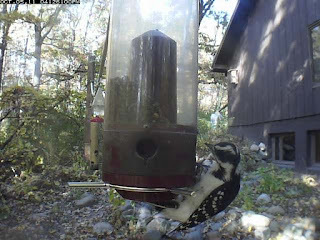 During the testing phase of the project, I was monitoring the system and noticed a hairy woodpecker land on the feeder. It is hard to read the tiny time stamp on the image but this was at 4:20 pm. Check out this second photo. It was taken just six minutes later at 4:26. The bird has drained that entire side of the feeder! 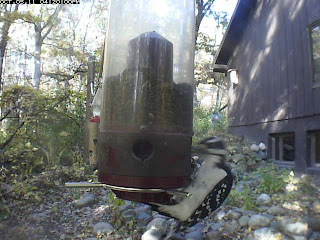 It was incredible to see how fast the bird was emptying the thing. I should note a couple of points though. 1) The central column restricts some of the available space for seed inside so it looks like it went through more seed than it did. 2) It is likely the bird did not eat all the seeds. Woodpeckers don't carefully pull one seed out of the feeder at a time, they hammer away and lots of seeds spill out in the process. We don't mind though. There are many birds that will only eat seeds off the ground and they won't perch on the feeder itself. They rely on the woodpeckers and other birds spilling seed so they can get to it. Fox sparrows, dark-eyed juncos and redpolls are good examples of birds we see feeding on the ground under the feeders. It was interesting to see this bird drain the seeds out so fast. I've always blamed the squirrels who in spite of this being a squirrel proof feeder still have learned how to chow down at the buffet. I guess the woodpeckers do their fair share as well. I'll be excited to post more images captured by the camera in the future and I'll let people know when it goes online.